You know what else makes me extremely, excited? Being able to share this incredibly delicious concoction with you. Rarely do I dream up desserts or recipes. Sometimes they work out, and sometimes they don’t. But this dessert I dreamed up, far exceeded all my expectations. It came together tasting better than I could have imagined. I was first tipped off about these Kraft Jet Puffed Caramel Vanilla Swirl marshmallows when The Stepford Kitchen made Rice Krispie Treats with them. I kept my eye out for them, but the grocery stores I shop at most often are Kroger and Publix, and I’ve never seen them there. Recently I was at Walmart, and (big surprise) browsing the baking aisle, and *ta-da* there they were. I immediately snatched some up, and saved them for the perfect occasion. When we decided to have a casual grill-out potluck for Mother’s Day, I knew this would be just the perfect dessert to bring. Line a 9x13in pan with plastic wrap and spray with nonstick spray. 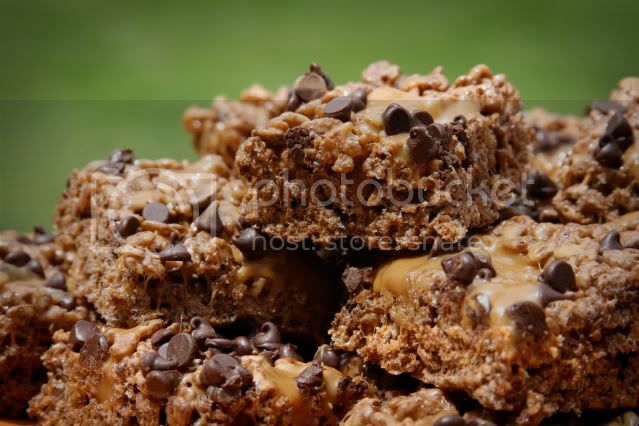 Melt caramels in double boiler or microwave, add milk or cream once melted and mix together. Meanwhile, as caramel is melting, melt butter in a large saucepan over low heat. 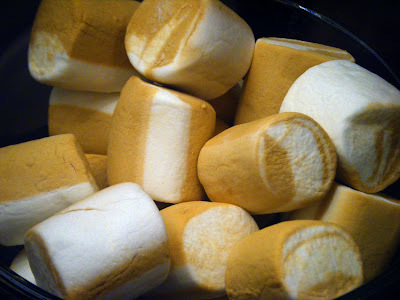 Once butter has melted add marshmallows, stirring occasionally until melted. Once melted, remove from heat, stir in cereal. Press into pan, (it really helps to use a spatula sprayed with cooking spray to press it down). 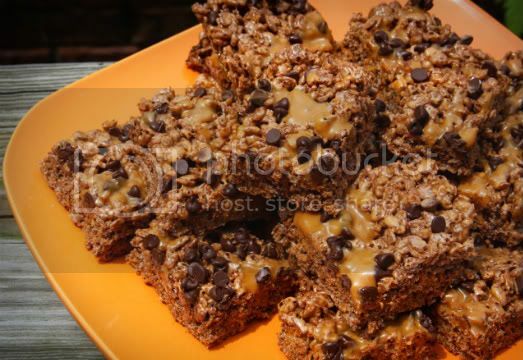 Drizzle melted caramel on top, then sprinkle with mini chocolate chips. Let cool, and cut into bars. Enjoy! I love coming up with recipes for cereal and potato chips!! Seems like there are always new and exciting creations just dying to be made! I haven’t seen those marshmallows around…probably a good thing! These sound very good! 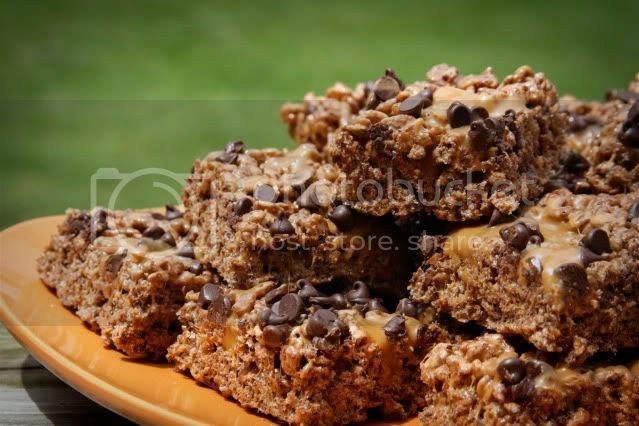 Great pic’s, those look delish! What a great combination! This looks delicious! 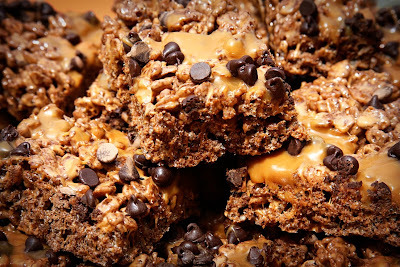 They look amazing – chocolate and caramel is such a delicious combo! Congrats on your new lens. The pictures are gorgeous. mmmm….i totally want to try these. 🙂 how dare you not save any for me. 😉 just kidding. the photos look great! Did you submit to tastespotting?! Those bars look scrummy too! I saw the caramel marshmallows at Target but didn’t know what to make with them.